Can football tell us if Ferrari are faster than Mercedes? ...bright eyed and bushy tailed for our first race of the season. Formula 1 cars are fast. That is taken as read. But exactly how fast they are is perhaps not something people dwell on too often. I am one of the people who does that. I am a senior aerodynamicist for an F1 team and I hope to try to explain to you some of the secrets behind F1 cars. I can't tell you my name, or where I work, because my team would not want me to be doing this. F1 is a secretive world. So let's just call me The Secret Aerodynamicist. In this first column, I am going to explain how the two cars expected to battle for this year's world championship differ in a crucial aspect of aerodynamic philosophy - and how it could mean that, although Ferrari have looked very strong in pre-season testing, they might find themselves down a dead end when it comes to developing and improving their car through the season. 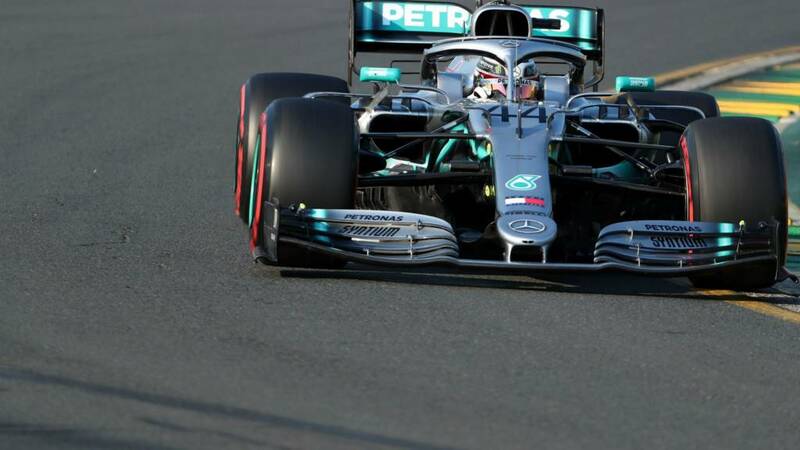 Lewis Hamilton pipped Mercedes team-mate Valtteri Bottas to pole position at the season-opening Australian GP. Hamilton was behind the Finn going into the final runs in qualifying but edged ahead by 0.112 seconds to take his sixth consecutive pole at Albert Park. Hamilton was a massive 0.704secs quicker than Ferrari's Sebastian Vettel in third, just ahead of new Red Bull's Max Verstappen. British rookie Lando Norris took a superb eighth on his debut for McLaren. And George Russell, the other British rookie, was 19th, well ahead of his Williams team-mate Robert Kubica. Fernando Alonso's Toyota team has won the World Endurance Championship race in Sebring, USA. We'll be back from 03:30 GMT tomorrow, with the race start at 05:10 GMT. What a brilliant qualifying session to start the season off with. The rookies and the newbies tested the experienced, and some of the midfield cars were right up there in the mix. But it wasn't a great day for everyone. There were some technical problems for Red Bull, some speed problems for Williams, some Kubicas getting in the way for Carlos Sainz, and then some just-not-a-good-day problems for the two Renault drivers Hulkenberg and Ricciardo. We have our qualifying podcast which will be available to download shortly, and some analysis from Andrew Benson on all you need to know about this grand prix in Australia. How many trophy cabinets does he have? How will they fare tomorrow? Last year, Hamilton took pole but Vettel won the race. As Sebastian said in his post-qualifying interview, it's not over until there's a chequered flag. SGJ: Where’s the crazy Helmut Marko? I thought he said Mercedes were behind both Ferrari and Redbull. Lando Norris, speaking to Sky Sports on his Q3 performance says: "I enjoyed it to a point. I was so nervous that it almost ruined the enjoyment. Enjoyment comes once I know I can complete a fast lap - that's what makes me happy, to see it all work and see a good qualifying session. "We had three runs and used three sets of softs our aim was just to try and get it to Q2 but we pushed and got it to Q3. It's massive to see that it is possible to do it and in some ways we've moved forward form last year - not that much but I feel I've maximized it as much as possible and we still need to do a lot of work to maintain these Q3's, today isn't a one off." Kimi Raikkonen, speaking to Sky Sports: "I bit disappointed the car had good speed but I didn't put a good enough lap together. We'll try to improve tomorrow." Ian Jones: Death. Taxes. HAM-BOT-VET. Michael Rand: Wow the gap between Mercedes and Ferrari is astronomical. Couple that with Vettel always bottling it against Hamilton, could be an interesting season. Plus, there is Leclerc for Vettel to also worry about. Josh Earle: Lando 8th on the grid, exceptional! Mercedes team principal, Toto Wolff speaking to Sky Sports, says: "I’m really overwhelmed after testing, it didn’t look like this at all - the team have done a great job as we pulled in everything we had. It's unbelievable really, but I need to keep both feet on the ground. "It’s one of Lewis’ fave tracks so it was a really great start for him. Reliability laws are always above us and we need to get a good start off line." Sebastian Vettel, who starts P3 tomorrow says: "Of course I think we can, you never know what's happening. The race is over when there's a chequered flag we have a good car and a good strategy we are here to race so we'll see what happens tomorrow." This is Hamilton's eighth pole. Second to that is Mika Hakkinen who had three at this circuit. That's a huge gap, so it seems inevitable that Hamilton would collect it once more today. Valtteri Bottas, who qualified in second: "We really made some good progress, I had a difficult practice three and we turned things around for the qualifying. "The Q3 lap one was really good, I enjoyed that. Fortunately it wasn't enough for pole but Lewis did a great job at the end and I struggled a bit in the first sector on the second run. "Anyway, it was fun and I look forward to tomorrow."